We are days away from Battleborn launching on May 3 and we want to get you mentally – and physically – prepared for the Varelsi onslaught heading your way. First off, Battleborn is now available to pre-load on Steam and Xbox One. PlayStation 4 pre-load will begin on May 1st. Pre-order your copy digitally through PlayStation Network, Steam, or the Microsoft Store now; then pre-load the game and get your gaming setup ready! Battleborn launch times will begin rolling out around the world starting at midnight, May 3rd for Auckland, New Zealand. Check the list below to see when Battleborn launches in major cities around the world. When can you begin playing Battleborn? Find the launch time in your time zone here. If you’re waiting on Battleborn reviews to make your decision, you can expect reviews to start hitting as of 10AM PDT on Monday, May 2 when folks in Australia, New Zealand and Asia begin their campaign to save the last star. 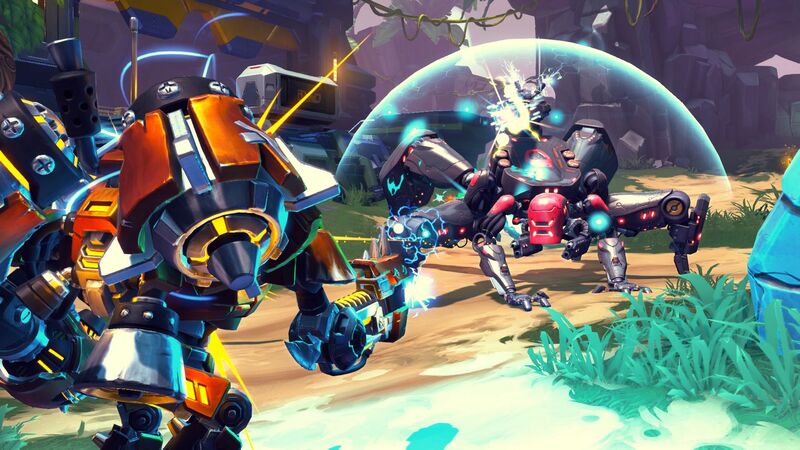 Battleborn’s an online co-operative and competitive game and it’s understandable that critics will want to test server infrastructure and play Battleborn in the same environment as everyone else before weighing in with a review score. So as such, you can expect to start seeing reviews-in-progress pop-up online starting May 2 and continue for a while until critics determine they’ve had a fair chance to pass judgement on the game. FREE HEROES, MAPS AND MODES COMING! You know how we’ve been telling you that Battleborn has 25 playable heroes? We’ve got more coming to help and there are no strings attached. That’s right, if you hadn’t already heard, five more heroes hit after launch – completely FREE – for all platforms, bringing the total roster to 30! In addition, competitive multiplayer modes, maps, balance updates, and community features will also be free. TIME TO PRE-ORDER IS RUNNING OUT! Don’t forget, pre-ordering means you also get a gang of bonus golden skins with the badass Firstborn Pack. You have until Monday, May 2 at 8:59PM PT / 11:59PM ET to pre-order Battleborn. After that, the Firstborn Pack goes the way of the rest of the universe – into the Void. Maximize your launch day hero skins collection with the Digital Deluxe Edition! This edition includes Battleborn the game, the Season Pass with all five DLC packs, five additional “Cyber” skins, keys to instantly access heroes 26-30 upon their release, as well as more digital goodies. Check out everything that is included in the Season Pass and Digital Deluxe Edition in this post. WHAT IS BATTLEBORN ALL ABOUT? With nihilistic robots, sword-licking vampires, space luchadores, interstellar soldiers, penguin-piloted murder machines, and lots of others, Battleborn has a large starting roster of 25 unique playable heroes. These heroes cover a huge variety of playstyles, weapon types, and personalities, and the roster will continue to grow with five additional, free heroes after launch. It’s up to you to command this motley crew through Story Mode and Competitive Modes in an attempt to save the universe. You can keep reading below to learn even more…..or……you could just click play and watch this badass Battleborn Bootcamp trailer. Dive solo into Battleborn’s playable Story Mode or bring some friends for 2-player console split-screen, or up to 5-play co-op across all eight episodes. Each episode tells a self-contained story about the Battleborn’s fight to save the last star, Solus, and is structured just like some of our favorite episodic television shows; from Star Trek and X-Files, to X-Men and Transformers. These episodes are highly replayable with 25 unique Battleborn heroes, and as you run through each episode with a different hero, the dialogue changes to reveal more backstory to the world and heroes as you play. Speaking of stories, check out the Battleborn Prequel Motion Comics to see how the fight to save Solus started. Before the Battleborn join together to save Solus, they fought amongst themselves for table scraps as the Varelsi sucked up what’s left of the entire universe. These rivalries still run deep and you can fight it out in Battleborn’s three Competitive Multiplayer Modes: Capture, Incursion, and Meltdown. Stake out your territory, destroy the enemy’s defenses, and send loads of robotic minions to meet their metal makers. Each mode has two maps and there’s even more to come after launch as both modes and maps will be free updates, but more on that later. Playing either Story Mode or Competitive Multiplayer Modes will earn you XP towards temporary Helix augmentations as well as persistent Command Rank and Character Rank levels. Helix: During a single Competitive match or Story episode, each level you gain activates a new Helix augmentation opportunity - all the way to level 10. Helix levels reset for each match or mission, meaning you can tailor your character’s abilities to the situation at hand. Character Rank: The more you play a character, the more XP you earn towards their persistent Character Rank, unlocking new Helix augmentations, taunts, titles, and skins for that character. Command Rank: Every Competitive match (excluding bots) and Story episode you play grants XP towards your player Command Rank. Rising through the ranks will unlock characters, new Gear options, titles, and more up to Command Rank 100. See you badasses on May 3!